On October 1, 2015, TASS Ural hosted a press conference on the arrival to the Ural Mountain region of the Kursk-Root Icon of the Mother of God "of the Sign", the main holy icon of the Russian diaspora. The icon will be available for veneration at the Church-on-the-Blood from October 2-7, 2015. The icon’s permanent home is the Synodal Cathedral of Our Lady “of the Sign” in New York, NY. 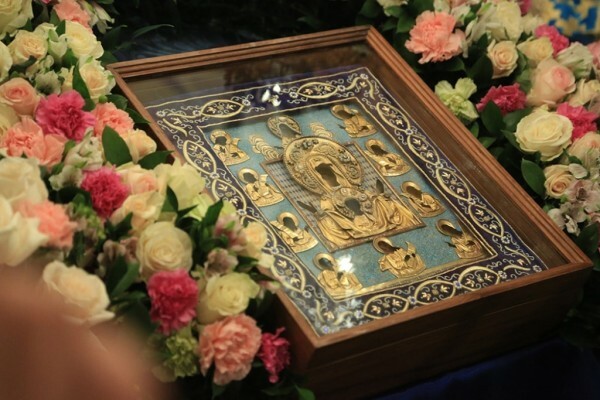 This icon of the Mother of God was first taken to Kursk, Russia, where it was first discovered over 700 years ago, and will now be in Ekaterinburg, brought by its caretaker, His Grace Bishop Nicholas of Manhattan. 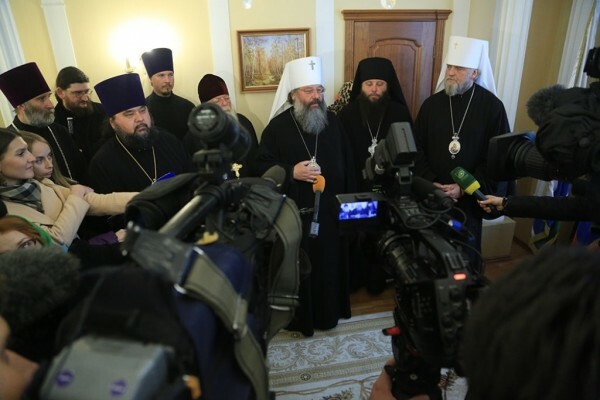 The accompanying clergymen hail from Orthodox churches in America, New Zealand and Australia: Protopriest Vladimir Boikov (New Zealand); Mitred Protopriest Stefan Pavlenko of California; Priest James Carles of Australia, who discussed the importance of this icon for the Russian Church Abroad. Hieromonk Kyrill (Korytko), Secretary of the Ruling Bishop of the Ekaterinburg Metropoliate, talked about the organization of the greeting and veneration of the Queen of Heaven in the form of Her icon. Fr Kyrill: The icon has never visited the Urals, so this event is a blessing of the Queen of Heaven Herself, who selected our city for Her visitation. We had to expend no special effort to bring it here, because of a fortunate coincidence of circumstances. We never thought that this icon could so easily make the trip to Ekaterinburg. Everything will have a pious and prayerful atmosphere. The airstrip will for the first time ever be filled with the peal of church bells in honor of the visit. As noted by Fr Kyrill, the icon will be available at the Church-on-the-Blood for all pilgrims from 7 am until 11 pm daily. Molebens and akathists to the Mother of God will be performed perpetually during the visit. Divine Liturgy and all-night vigil will also be celebrated daily. Of special interest to the journalists was the fact of miracles that occurred from this most holy icon of the Russian diaspora. The clergymen from New Zealand and the USA spoke on this topic. The Kursk-Root Icon of the Mother of God “of the Sign” visits our churches and parishes often. I have lived in New Zealand for 10 years, during which time the icon has visited four times. Our welcome events are, of course, much more humble than here in Ekaterinburg, and far fewer people participate. Still, people come to pray and beseech the Mother of God for Her intercession for their simple daily matters: to find a lost passport, to find a job, for healing from some ailment, utterly different pleas. I see among my own parishioners that many of their prayers are in fact answered. I was about 10 years old. My father was gravely ill with stomach problems. Forgive my frankness, but he exuded a terrible deathly odor. He suffered great pains, and so we asked that the Kursk-Root Icon be brought to visit him. So, of course, I burst into tears. Then next day, they operated—a Catholic dotor, a Jew and a Protestant; a rare combination of confessions. The surgeons warned us not to entertain hope for a successful operation—that is, they were really only opening him up to see the extent of his sickness. But when they cut him open, the doctors discovered that the previously-afflicted organs were like new, like those of a child, only covered by some sort of thin film that they needed to remove. The operation lasted a few hours, after which my father survived another 20 years. So that is our own family miracle. We have a custom in the Church Abroad that every parish priest who has this miracle-working icon in his church should bring it to the homes of his parishioners. This gives me great spiritual support, because that means I am able to be with the icon constantly, and bring this grace to the homes of my parishioners, to those who can’t travel to church. The main thing is how apparent their spiritual renewal is. Unfortunately, we can’t do the same in Russia, because of the sheer number of faithful, it would take hundreds of years! Tatyana Yaitskaya, the press conference moderator, noticed that holy icons and relics visit Ekaterinburg every two or three months, and asked about the Russian Church Abroad. The delegation expressed their opinion that the people of the Ural Mountains are fortunate. The lates icon to visit before the Kursk-Root Icon was the “Reigning” Icon of the Mother of God. This was connected to the unification of the Russian Orthodox Church and the Russian Orthodox Church Outside of Russia some 8 years ago. 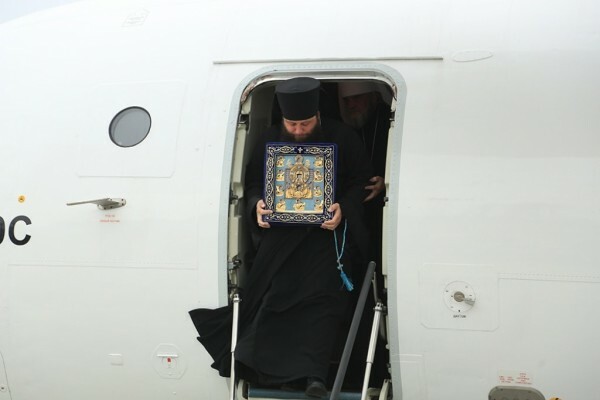 As Fr Vladimir explained, Russians living abroad often have to travel thousands of miles to venerate holy icons, and large welcoming celebrations are impossible due to various limitations. The press asked many questions about church life abroad. In particular, it was noted that in recent years, a migration process has taken hold—do Orthodox communities notice this? The delegation explained how people find spiritual succor in a new land. Fr Stefan: Once some people came to our church who only lived in America for a few years and didn’t know that there were Russian Orthodox churches there. Driving by, they noticed the cupola and were amazed—they gradually joined our community. If people know where there is a church, they often come, but if they aren’t interested… I think that people divided into those who are interested, and who need church, and those who are indifferent. The Lord opens a path for those who seek to live by faith. The fact that Ekaterinburg is often visited by holy icons, as you mentioned, is the achievement of the diocese and of Metropolitan Kirill of Ekaterinburg and Verkhotursk. The Kursk-Root Icon of the Mother of God “of the Sign” resides in New York but every year makes trips throughout the world. In 2015, with the blessing of His Holiness Patriarch Kirill of Moscow and All Russia, it has come to the Ural region for the first time ever. The icon is now at Znamensky Cathedral in Kursk, and tens of thousands of people have already come to venerate the Mother of God, many coming not only from all over Russia but even from other countries. The icon with be in Kamensk-Uralsk on October 7-10, then in Nizhy Tagila from October 10-12. It is expected that as many people will come to venerate the icon as visited the relics of Holy Great Martyr George the Victory-Bearer. Over 50,000 people have already visited the Church-on-the-Blood from neighboring towns, as well as from Khanty-Mansiisk Autonomous Region. Also representing the Russian Orthodox Church Outside of Russia is Protodeacon Alexander Kichakov of the Diocese of Chicago and Mid-America.